The black bile that has always been a part of us. An inspired and painstaking work that is also a joy to read. As a lay person wanting to get informed on the history, pathology, the war against, and the people behind this battle against cancer, I could not have picked a better book. Quite an amazing feat of presenting information in such a lucid and well-organized manner. What enhances the appeal of the book is the style of writing. It manages to achieve the fine balance between keeping it accessible for the lay reader and providing sufficient detail. This means that you can keep returning to the book for details that you may otherwise gloss over in your first reading. This is literally a biography of cancer. It is also a commentary on the treatments pursued over the millennia, and of the people who have spent their lives in pursuing a treatment, a cure of the disease. It is also an account of the people, outside the medical profession, who battled against cancer, by raising public awareness and leading campaigns to channel government funding into the research of the disease, to encouraging speedier trials of drugs and treatments that could then be rolled out to wider swathe of patients. This book also looks at the causes of cancer, from its genetic origins, to the factors that precipitate and increase the chances of cancer erupting in a human's body - carcinogens, among whom tobacco is perhaps the most famous of all. Cancer is perhaps the oldest disease to have killed man. A jawbone, dating back to 4000 BC, has signs of a "particular type of lymphoma", a cancer in the lymphatic cells. Six thousand years ago. Imhotep, the Egyptian physician, who lived in the 27th century BC,who made notes on diseases he encountered in patients, fell "atypically silent" with case number forty-five. As you read the book, you learn that people have written about this affliction for the longest time. The ancient Greek physician, Claudius Galen, writing almost two thousand years ago, was more right about the nature of cancer than was realized through most of the twentieth century as science made progress into the roots of cancer. The theory of "black bile" may not be very scientific sounding, but as the book progresses the author makes it clear that the nature of cancer is not dissimilar to this theory of black bile - it was not enough to simply remove the afflicted part of the body to rid it of cancer. Cancer had a way of flowing from the diseased portion to other parts of the body, much like the bile that Galen had described. The human body, Hippocrates proposed, was composed of four cardinal fluids called humors: blood, black bile, yellow bile, and phlegm. Galen proposed that cancer was “trapped” black bile—static bile unable to escape from a site and thus congealed into a matted mass. The problem with treating cancer surgically, Galen suggested, was that black bile was everywhere, as inevitable and pervasive as any fluid. You could cut cancer out, but the bile would flow right back, like sap seeping through the limbs of a tree. The surgical removal of tumors—a local solution to a systemic problem—was thus perceived as a fool’s operation. But he had uncannily captured something essential about cancer in his dreamy and visceral metaphor. Cancer was often a humoral disease. Crablike and constantly mobile, it could burrow through invisible channels from one organ to another. It was a “systemic” illness, just as Galen had once made it out to be. By so describing cancer, and making it out into an incurable disease, for which no procedure or operation was likely to have any effect, Galen did a huge favor to the victims of cancer that were to follow in the coming centuries. Unwittingly, Galen may actually have done the future victims of cancer a favor—at least a temporary one. In the absence of anesthesia and antibiotics, most surgical operations performed in the dank chamber of a medieval clinic—or more typically in the back room of a barbershop with a rusty knife and leather straps for restraints—were disastrous, life-threatening affairs. By the time we near the beginning of the twentieth century, the theory that cancer was actually a disease marked, more by anything else, by uncontrolled cell division, had started to take shape. As the century progressed, vaccinations, sterilization of surgical tools, and improved sanitation conditions meant that deaths because of other diseases declined, and cancer began to emerge as a killer in its own right, jostling to claim top spot as the world's foremost killer. Between 1900 and 1916, cancer-related mortality grew by 29.8 percent, edging out tuberculosis as a cause of death. By 1926, cancer had become the nation’s second most common killer, just behind heart disease. By the early twentieth century, many locally restricted cancers (i.e., primary tumors without metastatic lesions) could be removed by surgery. These included uterine and ovarian cancer, breast and prostate cancer, colon cancer, and lung cancer. If these tumors were removed before they had invaded other organs, these operations produced cures in a significant fraction of patients. The most significant advance in the cure of cancer came out with the discovery of radium by Marie Curie and her husband. That radiation can kill humans is also the reason why it was so useful against cancers. DNA is an inert molecule, exquisitely resistant to most chemical reactions, for its job is to maintain the stability of genetic information. But X-rays can shatter strands of DNA or generate toxic chemicals that corrode DNA. Cells respond to this damage by dying or, more often, by ceasing to divide. X-rays thus preferentially kill the most rapidly proliferating cells in the body, cells in the skin, nails, gums, and blood. When science stumbled on chemotherapy as a cure for cancer, and even though it took oncology several years to realize that chemotherapy offered a fairly relapse-free cure for cancer, cancer chose to dig deep to survive, away from the treatment. Deep inside the human body itself. Not until several years later did it strike the board that had fired Li so hastily that the patients he had treated with the prolonged maintenance strategy would never relapse. This strategy—which cost Min Chiu Li his job—resulted in the first chemotherapeutic cure of cancer in adults. The next regimen they would try would be a combination of all four drugs: vincristine, amethopterin, mercaptopurine, and prednisone. The regimen would be known by a new acronym, with each letter standing for one of the drugs: VAMP. But the same system had likely also kept VAMP out of the nervous system, creating a natural “sanctuary” for cancer within the body. The leukemia, sensing an opportunity in that sanctuary, had furtively climbed in, colonizing the one place that is fundamentally unreachable by chemotherapy [bold emphasis mine]. The children died one after the other—felled by virtue of the adaptation designed to protect them. Chemotherapy was only one way of treating cancer. Cancer is incredibly varied. The treatment of cancer demanded a similar amount of flexibility, a realization that came only with the passage of time. Cancers possessed temperaments, personalities—behaviors. And biological heterogeneity demanded therapeutic heterogeneity; the same treatment could not indiscriminately be applied to all. But even if Kaplan understood it fully in 1963 and made an example of it in treating Hodgkin’s disease, it would take decades for a generation of oncologists to come to the same realization. Tobacco has long been linked to cancer, even though the tobacco industry spent huge sums of money over decades and decades in denying any such links. Apart from outright denial of any causal link between smoking and cancer, suppressing and discrediting research that established such links, the tobacco industry has had access to a vast arsenal of weapons of mass obfuscation. The author is rightly indignant when he outlines just some of these vile tactics employed by the tobacco industry. In 1870, the per capita consumption in America was less than one cigarette per year. ...By 1953, the average annual consumption of cigarettes had reached thirty-five hundred per person. On average, an adult American smoked ten cigarettes every day, an average Englishman twelve, and a Scotsman nearly twenty. ...By the early 1950s, though, cigarette ads, and cigarette brands, were being “designed” for segmented groups: urban workers, housewives, women, immigrants, African-Americans—and, to preemptively bell the medical cat—doctors themselves. In 1964, the FTC proposed stamping a warning message on all cigarette packages that struck a cold stab of fear through the tobacco industry. Caution: Cigarette Smoking Is Dangerous to Health. It May Cause Death from Cancer and Other Diseases. The response of the tobacco industry? Equally cold and calculating. They "voluntarily requested regulation by Congress". Why? Because tobacco was the economic lifeline of several Southern states, "Congress, it was well-known, would inherently be more sympathetic to the interests of tobacco makers." Tobacco was the economic lifeblood of Southern states, and the industry had bribed politicians and funded campaigns so extensively over the years that negative political action was inconceivable. Conversely, the FTC’s unilateral activism on tobacco had turned out to be such a vexing embarrassment to politicians that Congress was expected to at least symbolically rap the wrist of the vigilante commission—in part, by lightening its blow to tobacco. As a result, the the Federal Cigarette Labeling and Advertising Act (FCLAA) of 196 changed "the FTC’s warning label to Caution: Cigarette smoking may be hazardous to your health." The dire, potent language of the original label—most notably the words cancer, cause, and death—was expunged. To ensure uniformity, state laws were also enfolded into the FCLAA—in effect, ensuring that no stronger warning label could exist in any state in America. Politicians were far more protective of the narrow interests of tobacco than of the broad interest of public health. But this naked dance of deception does not end here. The tobacco industry was ready to concede as a smokescreen, practically meaningless concessions in return for tangible gains. ...beleaguered in America, the Marlboro Man has simply sought out new Marlboro countries. Tobacco smoking is now a major preventable cause of death in both India and China. In a perverse recapitulation of the FCLAA “warning labels act” of the 1970s, in fact, the agreement likely creates yet another safe harbor for the tobacco industry. By granting relative protection from future legal action, by restricting cigarette advertising, and by allowing its signatory companies to fix prices, the agreement provides a virtual monopoly to the companies that have signed the MSA. It remains an astonishing, disturbing fact that in America—a nation where nearly every new drug is subjected to rigorous scrutiny as a potential carcinogen, and even the bare hint of a substance’s link to cancer ignites a firestorm of public hysteria and media anxiety—one of the most potent and common carcinogens known to humans can be freely bought and sold at every corner store for a few dollars. It is a well known but depressing fact that people tend to convert any slight hope of a cure for an illness into a silver bullet. The same was the case with chemotherapy and almost every other treatment before that seemed to have some effect on cancer. That it was effective against cancer was undeniable. That it turned out to have side-effects sometimes worse than the disease it was attempting to cure was often overlooked, sometimes dismissively so. In India , there is a saying that goes, "loha lohe ko kat-ta hai", which means that ion cuts iron. Rose Kushner (by then, a member of the National Cancer Advisory Board) warned against the growing disconnect between doctors and their patients. “When doctors say that the side effects are tolerable or acceptable, they are talking about life-threatening things,” she wrote. “But if you just vomit so hard that you break the blood vessels in your eyes . . . they don’t consider that even mentionable. That this turn of events—aggressive chemotherapy and marrow transplantation mandated by law—was truly extraordinary was not lost on many observers. It was, at face value, a liberating moment for many patients and patient advocates. But medical journals ran rife with scorching critiques of the protocol. It is a “complicated, costly and potentially dangerous technology,” one article complained pointedly. The litany of complications was grim: infections, hemorrhage, blood clots in the arteries and the liver, heart failure, scarring of lungs, skin, kidneys, and tendons. Infertility was often permanent. Patients were confined to the hospital for weeks, and most ominous perhaps, between 5 and 10 percent of women ran the risk of developing a second cancer or precancerous lesion as a result of the treatment itself—cancers doggedly recalcitrant to any therapy. Perhaps the biggest insight at a high level that has emerged recently is that cancer is "not merely genetic in its origins; it was genetic in its entirety". Cancer, in short, was not merely genetic in its origin; it was genetic in its entirety. Abnormal genes governed all aspects of cancer’s behavior. Cascades of aberrant signals, originating in mutant genes, fanned out within the cancer cell, promoting survival, accelerating growth, enabling mobility, recruiting blood vessels, enhancing nourishment, drawing oxygen—sustaining cancer’s life. These gene cascades, notably, were perversions of signaling pathways used by the body under normal circumstances. The “motility genes” activated by cancer cells, for instance, are the very genes that normal cells use when they require movement through the body, such as when immunological cells need to move toward sites of infection. Tumor angiogenesis exploits the same pathways that are used when blood vessels are created to heal wounds. Nothing is invented; nothing is extraneous. Cancer’s life is a recapitulation of the body’s life, its existence a pathological mirror of our own. That cancer is a stubborn affliction is not new. It is only in recent times that we have truly begun to understood the extent to which cancer can mutate and adapt, using the body's intrinsic defense mechanisms against itself. ... these two traditional Achilles’ heels of cancer—local growth and rapid cell division—can only be targeted to a point. Surgery and radiation are intrinsically localized strategies, and they fail when cancer cells have spread beyond the limits of what can be surgically removed or irradiated. More surgery thus does not lead to more cures, as the radical surgeons discovered to their despair in the 1950s. In the era of nontargeted drugs, cancer cells were known to become drug-resistant through a variety of ingenious mechanisms. Some cells acquire mutations that activate molecular pumps. In normal cells, these pumps extrude natural poisons and waste products from a cell’s interior. In cancer cells, these activated pumps push chemotherapy drugs out from the interior of the cell. Spared by chemotherapy, the drug-resistant cells outgrow other cancer cells. Other cancer cells activate proteins that destroy or neutralize drugs. Yet other cancers escape drugs by migrating into reservoirs of the body where drugs cannot penetrate—as in lymphoblastic leukemia relapsing in the brain. In closing, the author's vision of how treatment of cancer may look like four decades hence centers mostly on the assumption that we would have understood enough of the genetic foundations of cancer to allow medicine to formulate cures based on this knowledge. Such a cure will be based on a combination of targeted surgery, gene mapping to formulate a cocktail of drugs to "prevent, cure, or palliate the illness", lasting the the life of the patient. That cancer will still remain fundamentally incurable, only suppressable, is a sobering assessment the author makes. This book is one of the best books I have read, not just this year, but in a long, long time. Very, very highly recommended. What I found pleasantly surprising was that of the two other shortlisted for the Pulitzer Prize in the 'General Nonfiction' category, I had also started reading “The Shallows: What the Internet Is Doing to Our Brain ,” by Nicholas Carr . I have finished reading "The Shallows", and will try post a review soon. Given the in-control, fluid, and effortless command over the narrative, there are some, very few in fact, occurrences where there the prose takes a distinctly ornate patina. Just a handful. 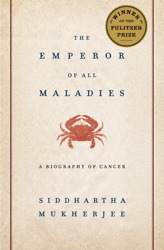 Buy The Emperor Of All Maladies from Flipkart.com- the book is currently available at a whopping 40% discount on Flipkart.com, for Rs 299. That's a steal.